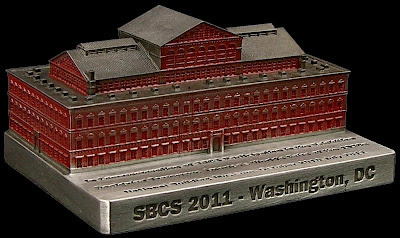 InFocusTech created this year’s Souvenir Building Collector’s Convention commemorative building. It’s not only a souvenir of last weekend’s convention, but also a memory of the group’s participation in the Designing Tomorrow – America’s World’s Fairs of the 1930’s with text on the base. Mike and sons previously made a replica of the National Building Museum with a silver finish and in two sizes, but this one looks really great and its color is true to the real building’s red brick exterior.